There probably aren't many households that don't have at least one imprinted calendar magnet on the kitchen refrigerator. And that's what makes them such a great promotional product! When you put your company's name on a customized calendar magnet, it will be seen multiple times a day. 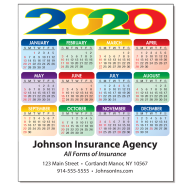 Colorful and eye-catching, promotional calendar magnets are a highly effective marketing tool. They catch the attention of your potential customers and put your brand into the spotlight multiple times a day. 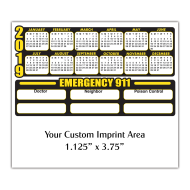 Whether your customers place your custom magnetic calendar on their refrigerator or a filing cabinet, they are sure to see it regularly. Virtually any small business, especially those that are consumer-related, can use them as a marketing tool and benefit from their exposure potential. 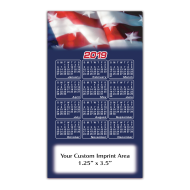 When placed on a desk, table or countertop, these calendar magnets invite your customers to take one and leave with a reminder of your company and services, or they can be mailed with greeting cards, invoices or year-end statements. What are you waiting for? 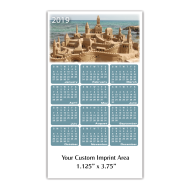 Order your customized calendar magnets now!